When universities raise fees significantly, or raise them at all, the institutions, the politicians and the public all need to understand what effect this has on those students who most need support to access higher education. Raising fees beyond what poor students can afford is theft. It is the theft of opportunity. It is the theft of potential. It is the theft of the one escape poor students have from the cycle of poverty. By DYLAN BARRY. “Being intelligent is not good enough if you are poor.” This is the slogan around which the University of the Witwatersrand (Wits) protest against fee increases is being mobilised. For most young South Africans this is the reality of our higher education system and 2015 has made that clear. 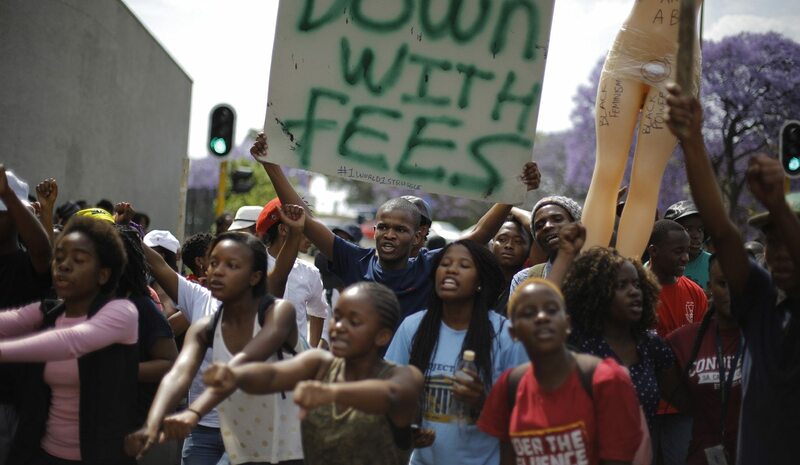 In February, the Wits Student Representative Council (SRC) raised R1.8-million in its One Million One Month campaign in response to the National Student Financial Aid Scheme (NSFAS) crisis. As a volunteer on that campaign I know it took a lot of hard work to raise that much; and yet it was only enough to fund the reduced registration fees for just over 100 students, while over 2,000 students were still financially excluded because the NSFAS could no longer fund their studies. These were students who had passed their courses, many of whom were going into the final year of their degree, almost all of them were poor and black. They all had to go home. Because being intelligent is not good enough if you are poor. A large majority of Wits students are on some kind of financial aid or scholarship, which means a large majority of Wits students cannot afford to pay the full tuition on their own. Most of these scholarships and bursaries are lump sum contributions. This means that if they cover all the costs of tuition, that’s fantastic, but if they don’t, the shortfall must be made up by the students themselves. Fee increases hit the students who are most reliant on financial aid the hardest – if your bursary is a lump sum contribution and covers 50% of your tuition, a fee increase of 10% increases the shortfall you end up paying by 20%. If your financial support covers 75% of your tuition, the shortfall you pay goes up by 40%. So, the greater your need for financial support the more fee increases will hurt proportionately. As a consequence, when universities raise fees significantly, or raise them at all, the institutions, the politicians and the public all need to understand what effect this has on those students who most need support to access higher education. Raising fees beyond what poor students can afford is theft. It is the theft of opportunity. It is the theft of potential. It is the theft of the one escape poor students have from the cycle of poverty. Because being intelligent is not good enough if you are poor. South Africa has the worst levels of income inequality of any major economy in the world. By the most recent World Bank estimates, South Africa’s levels of inequality have risen since the end of apartheid. In contrast Brazil, our closest rival in the inequality sweepstakes, decreased its levels of income inequality significantly over the same period. How did Brazil manage that? The answer is not simple, but a significant part of that reduction was achieved by reducing the skills gap through increased access to education. The skills gap is the difference between the skills the economy needs and the skills the workforce can provide, and in South Africa the gap is stark. We have more unskilled labour than the economy demands and more demand for skills than the workforce can supply, and consequently unskilled workers are paid very little, skilled workers are paid a lot, and we have a very high unemployment rate. To reduce inequality we need to produce more skilled university graduates, to produce more skilled university graduates we must lower the financial barriers to tertiary education. Because being intelligent is not good enough if you are poor. The nature of the skills gap and and the nature of higher education combine to maintain the structure of an economy that is not radically different from the economy crafted by the architects of apartheid. Students from poor families, who remain largely black, cannot afford higher education, regardless of their academic potential or academic record, and enter an economy that punishes them for that very lack of higher education. It means that, beyond any influence of merit or hard work, poor students stay poor, while rich students will likely stay rich. Because being intelligent is not good enough if you are poor. The Wits Shutdown has been incredibly well organised under the joint leadership of outgoing SRC president Shaeera Kalla and incoming SRC president Nompendulo Mkhatshwa. It has been a disciplined, peaceful process, with leadership playing a strong role in keeping it that way despite significant provocation. The protest has seen protesting students tear-gassed and pepper-sprayed, assaults by police, and two protesting students hit by cars. It has seen two protesting students hospitalised. Up until Monday 19 October, after almost six days of protest, there had not been a single incident of a non-protester being harmed at any point during the protest’s proceedings. This protest has been disciplined, it has been organised, and it should be applauded. Dylan Barry is a second-year BSc student at Wits. Photo: Some of the thousands of students from Wits University demonstrate during another day of demonstrations against fee increases at their university, Johannesburg, South Africa, 20 October 2015. EPA/KIM LUDBROOK.